When someone says 3D, your mind would come up with 3D glasses and some movies. 3D technology is a really nice one, as you get a whole new experience watching stuff. I remember watching a 3D cartoon movie once, it was really good specially the cute glasses they give :). Now, the whole idea of 3D technology is going to be changed with the iPoint 3D designed by Fraunhofer-Gesselschat. 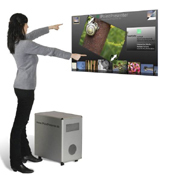 This technology would help you control your 3D TV and computer, simply with your hand gestures. The best part of it is that you require no glasses do this.